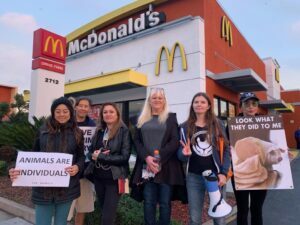 Why Would Vegans Visit McDonald’s for Bacon Hour? #JaneUnChained #LIVE at a protest against McDonald’s for its new promotion of bacon. 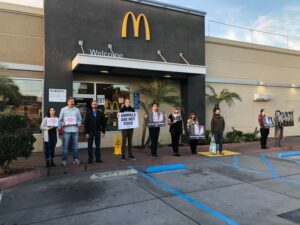 Santa Monica police are called as protesters enter the McDonalds to urge the company to stop promoting a product that requires the slaughter of innocent pigs. 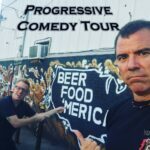 They also point out bacon is processed meat! The World Health Organization has declared processed meat to be carcinogenic. You can find bacon in the same category as tobacco product. We are sure people would be appalled if McDonald’s was handing out free cigarettes with every meal. Most would refuse to consume a product they know could cause them great bodily harm. So why do we still eat bacon? This group DxE activists protested in Santa Monica for pigs who do not want to become bacon! 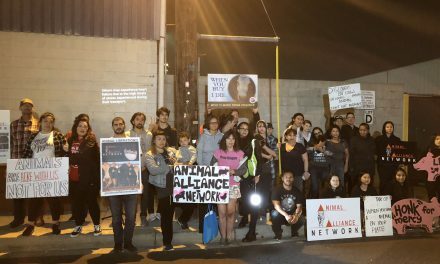 Protests organized by Brittany Michelson with the Direct Action Everywhere – DxE Los Angeles chapter. McDonalds and other companies mentioned are invited on any time to respond. 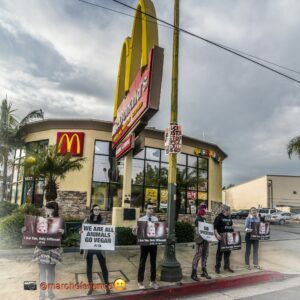 #Janeunchained LIVE at McDonald’s in San Diego with Direct Action Everywhere – DxE protesting #baconhour! Bacon is processed meat. Processed meat has been determined to be carcinogenic by the World Health Organization (WHO). Why eat bacon when there are so many other more healthy plant-based options. Tracy Childs showed us how to make eggplant bacon recently with liquid smoke. 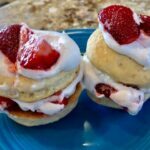 This can be done with several other plants from zucchini to coconuts, and there are plenty of plant-based vegan bacon options at the store from tempeh to soy-based products. DxE San Diego organizer, Melanie Arce, explains that they are there to speak up for the pigs against the use of their bodies in the form of bacon at this free bacon hour. She explains that anyone can order anything off the menu and get free bacon on the side. She says not only should bacon not be given away for free but it shouldn’t be eaten at all. Pigs are so genetically close to humans genetically that we can use pieces of them to repair our bodies. McDonald’s is invited at any time to respond to the protesters! Tracy Childs reporting for Jane Unchained News Network. Photos courtesy of Tracy Childs. 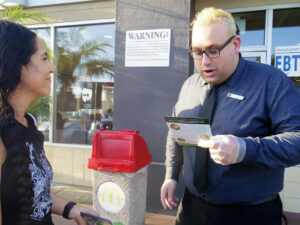 One manager came out to speak to activists and learn more about choosing a compassionate lifestyle. 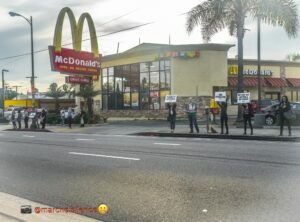 Activists in support of PETA line the street in front of McDonald’s in Los Angeles. 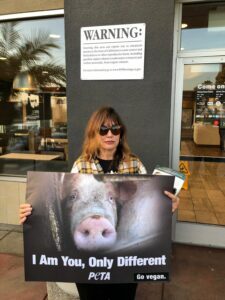 #JaneUnChained #LIVE at McDonald’s in Los Angeles, California where local PETA (People for the Ethical Treatment of Animals) supporters protest “Bacon Hour” at Mcdonald’s. 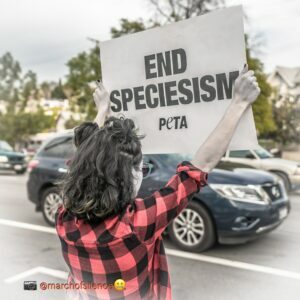 This protest was organized by Matt Braun, the Outreach Coordinator at the Peta office in Los Angeles. It’s not what you’re eating but whom. The level of cognitive dissonance was apparent this day as two pedestrians who passed by chimed in with their opinions. One of which has been vegan for 48 years but thinks that hunting is natural and the killing of an innocent creature is justified for food. 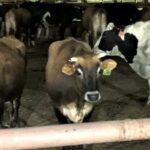 Another understood that milk products are for that particular animal’s baby, but said that it was his God-given right according to the Bible to eat meat. 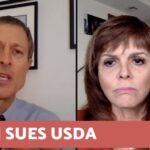 It’s no wonder that we have not evolved past the use of animal products with people who have failed to be informed. 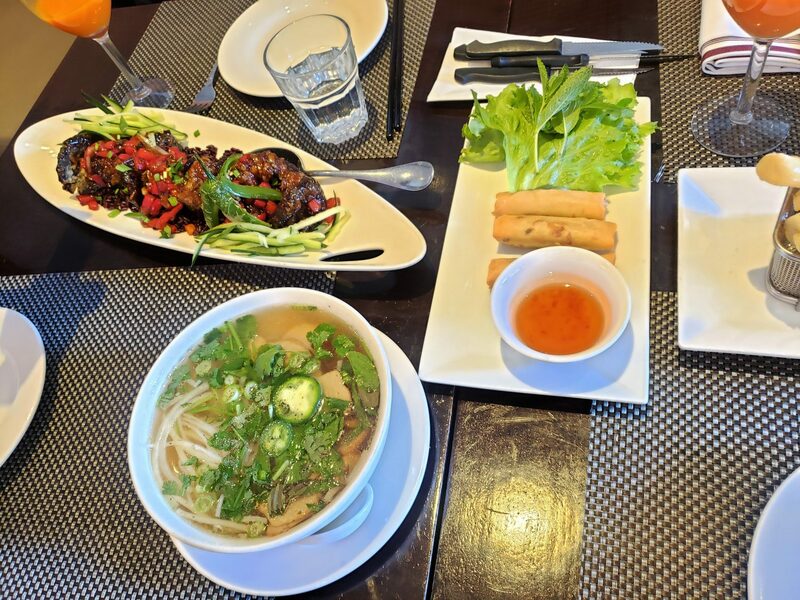 We hope that one day we will see more vegan options at establishments like these, and we can change “Bacon Hour” to “Veggie Bacon Hour” one day soon! Activists sacrifice their time to speak up for other animals who cannot speak for themselves. 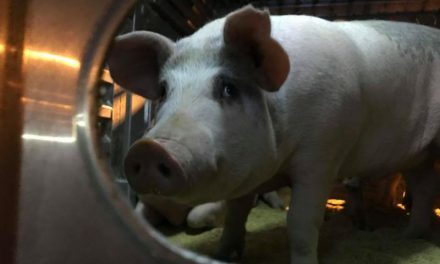 Pigs are just as sentient and often times smarter than dogs. There is no difference. McDonald’s and any other companies mentioned are invited on at any time to respond. Ellen Dent reporting for JaneUnchained News Network. Photos courtesy of March of Silence. 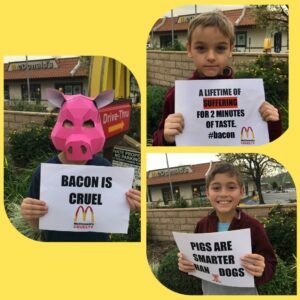 Kid activist brothers Aveyron (masked), Atticus (top), and Alastair were at the protest in Calabasas to make sure the voice of future vegan generations were heard this day! NextThe Best New Shop in Town, Besties Vegan Paradise! Flesh and Blood on Hollywood Blvd! 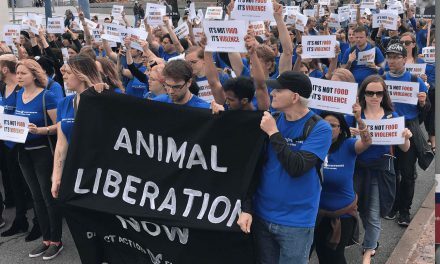 Massive California Animal Rights Protest! We Are Destroying Our Planet by Killing Them!